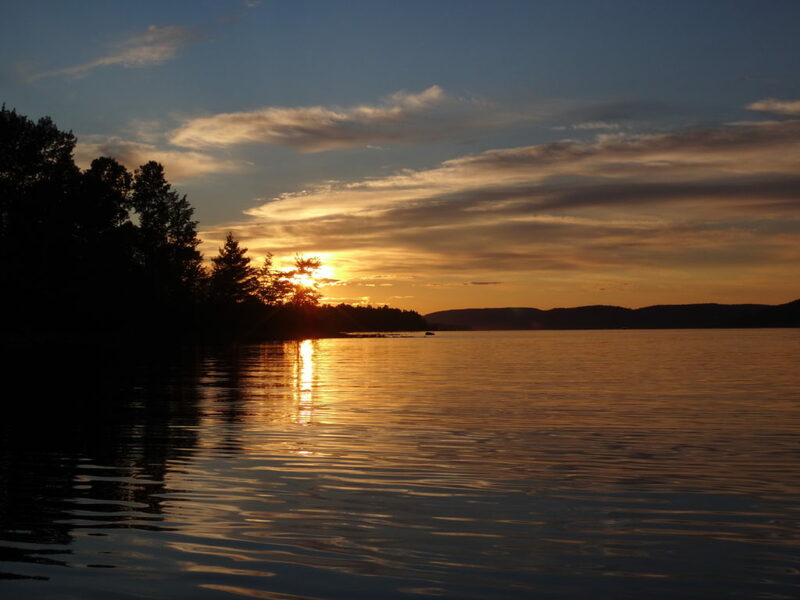 An evening calm has settled over the Ottawa River as I paddle into a burnished, copper sunset. I trail a fly behind the canoe, more from habit than hope. If I really wanted to catch fish, I would trail a spinnerbait for pike, or rig a artificial minnow for walleye. Mostly, I just enjoy the quiet, made more pronounced by the occasional powerboat thrumming in the distance. On the Quebec side, I see lights begin to glimmer on the houseboats beached at the point. Laughter carries across the water. Nearer, on my left, I see a whitetail deer come shyly down to the beach in the deepening dusk, as a wood thrush begins to flute in the woods. Abruptly, the sandy bottom rises below my canoe. I ship my paddle and quickly wind in my fly. Then I continue into the bay toward the boat launch, passing Lamure Beach and threading through the moored boats. I pull out the canoe and drag it up to the trees with the others. Then I stroll through the peaceful streets until I see home and the glow of warm, yellow light through the blinds of the large front window. The town of Deep River lies an easy two hour drive northwest of Ottawa along Highway 17. Sandwiched between the highway and the Ottawa River, it trails along the shoreline for a couple of kilometers. The usual Tim Hortons, Canadian Tire, motel and small strip malls service the highway. A busy grocery store, post office, shops, cafes, school, and town office anchor the small, downtown core, which sits just behind the waterfront, overlooking the river. The marina and yacht club lie only a brisk two minute walk away. Tidy residential neighbourhoods lie either side of downtown — a mix of small, renovated, post-war bungalows and more modern, multi-story houses. 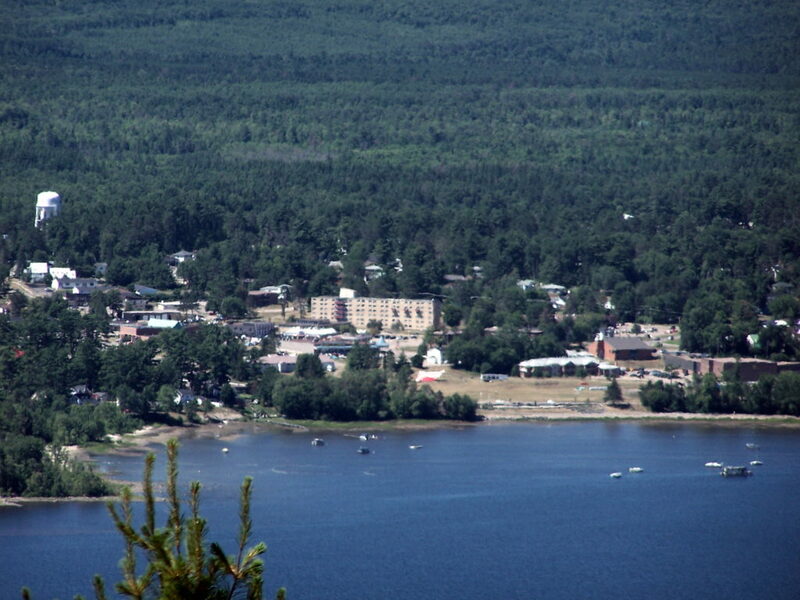 The Deep River Regional Hospital marks the east side of town, while the Mount Martin Ski Club sits on the west side. I spend at least two weeks every summer in Deep River with my wife and our sons. We make shorter visits throughout the year. I spend most of that time outside, exploring the local forests and wetlands, or paddling the shoreline of the Ottawa River. 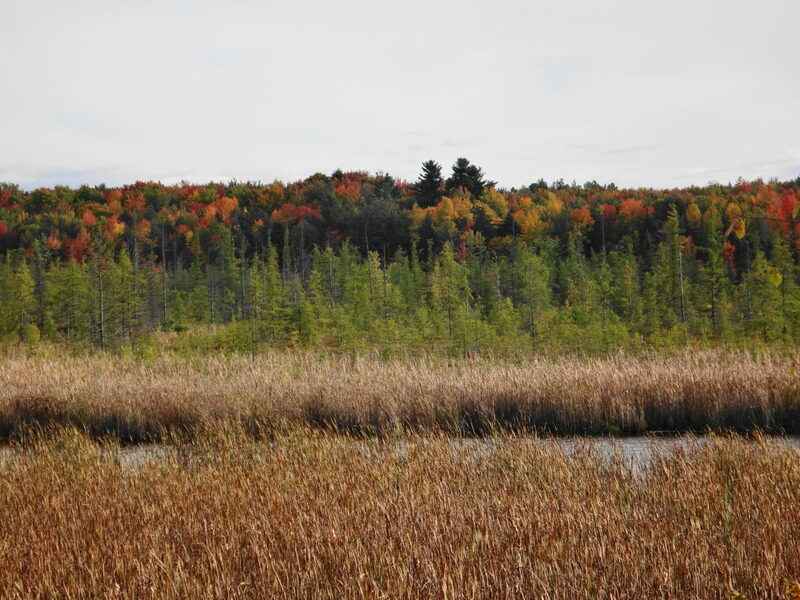 Deep River is a microcosm of whole Ottawa Valley, with almost every kind of ecosystem, habitat and wildlife species within easy reach. 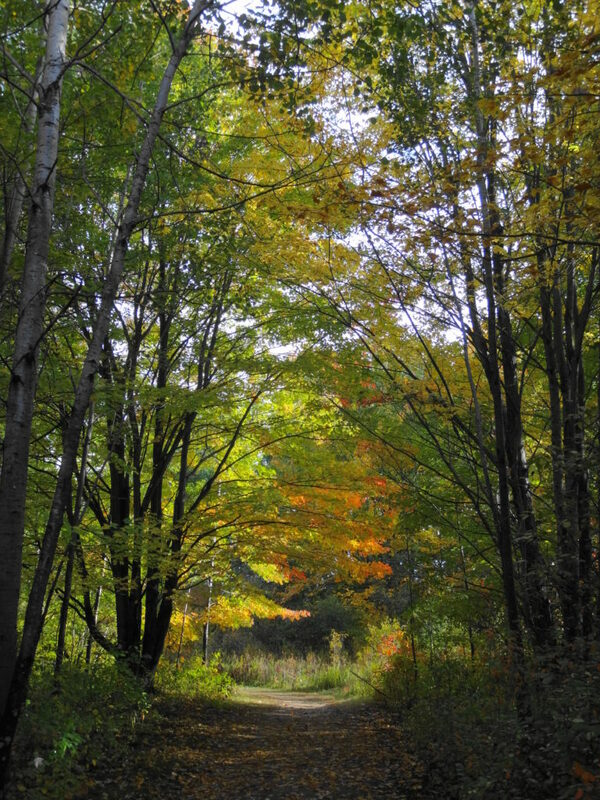 Most trips to Deep River begin and end at the Four Seasons Forest Sanctuary, on the southeast side of the town. 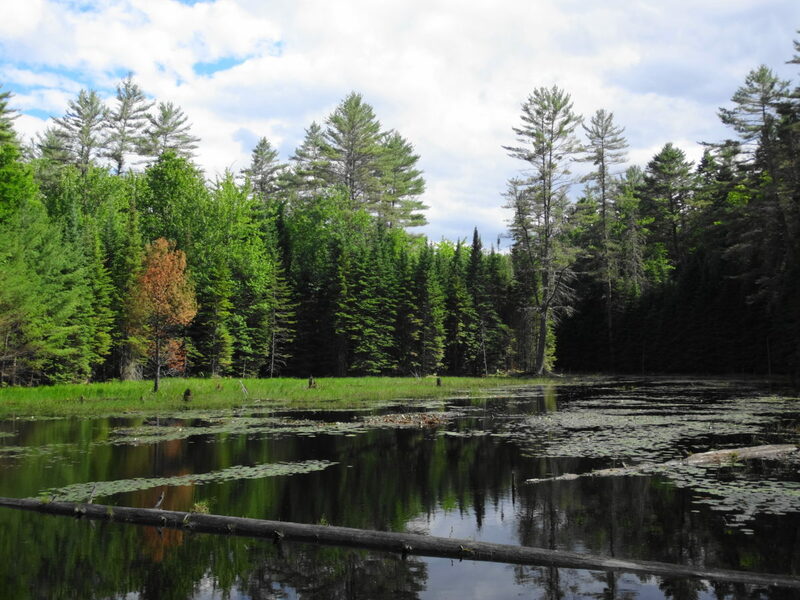 This community-owned forest is part of an enormous, contiguous, protected natural area that includes the restricted lands surrounding the Canadian Nuclear Laboratories (formerly AECL) in Chalk River, the Petawawa Research Forest, the training areas of Canadian Forces Base Petawawa, and Algonquin Park. 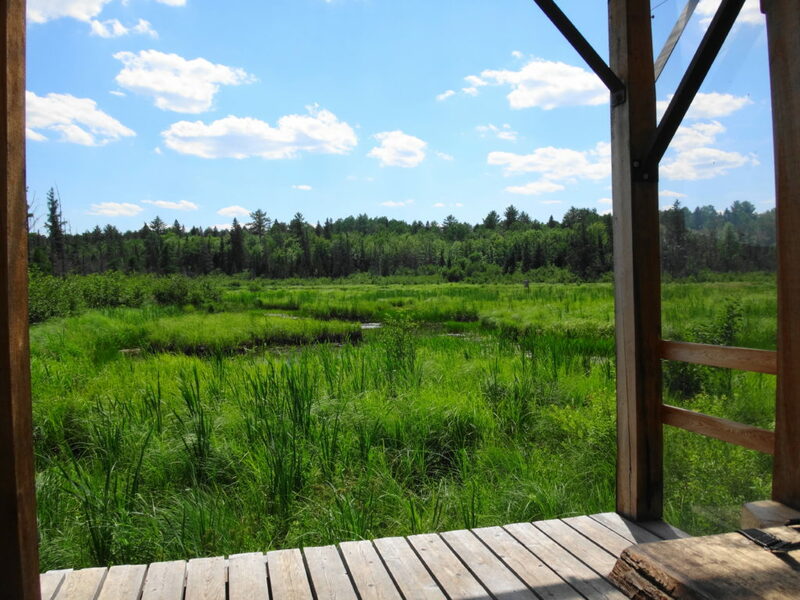 A short hiking loop begins across from the hospital and leads to a pretty, covered shelter overlooking a wetland. Even on the buggiest days, the squadrons of dragonflies hunting along the marsh edge succeed at keeping most mosquitoes at bay. Common yellowthroats sing in the thickets, while swamp sparrows skulk in the reeds. An American bittern grunts deep in the marsh. A blue heron fishes along the meandering stream on the other side. Turtles and frogs bask in the small pond by the shelter, where an occasional beaver, muskrat or otter makes an appearance. I’ll bring a lunch and meditate on the scene, read a book, or bring a guitar. Almost always, I’m on my own. 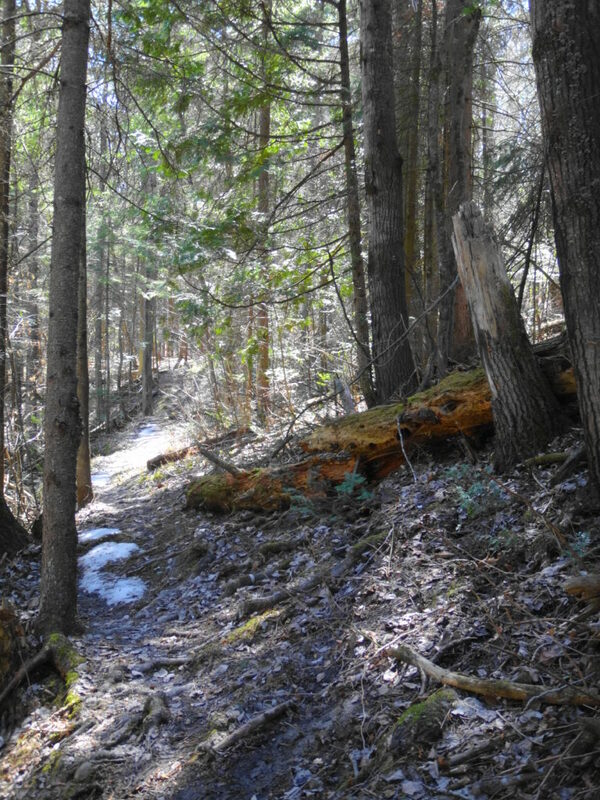 Longer trails lead deeper into the sanctuary, passing a variety of habitats: upland forests of white pine, maple and beech; darker forests of spruce and balsam fir; pretty riparian marshes, and dark forest pools; bright, grassy clearings, and shadowed fern gardens. 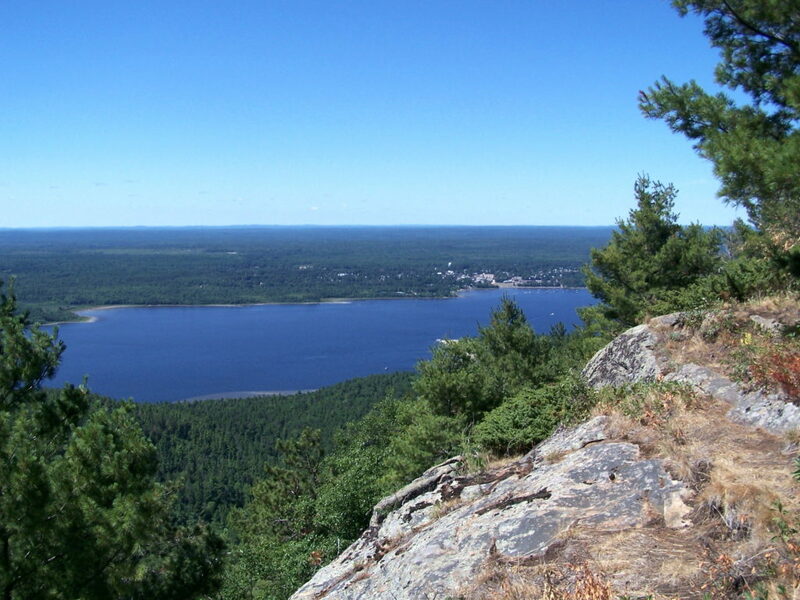 One of my favourite destinations is Cranberry Lake, which stretches back into the AECL lands. At the end of a half hour hike, a small bench looks out over the lake and a pretty, floating fen mat. In late June and early July, white waterlilies carpet the water, and pink orchids (swamp pinks and rose pogonias) dot the fen. I often skip the bench and stretch out under the white pine that graces the shoreline, closing my eyes for a nap in midday sunshine. Occasionally I lift my head and look down the lake, hoping to see one of the moose that have found a haven on the AECL lands. 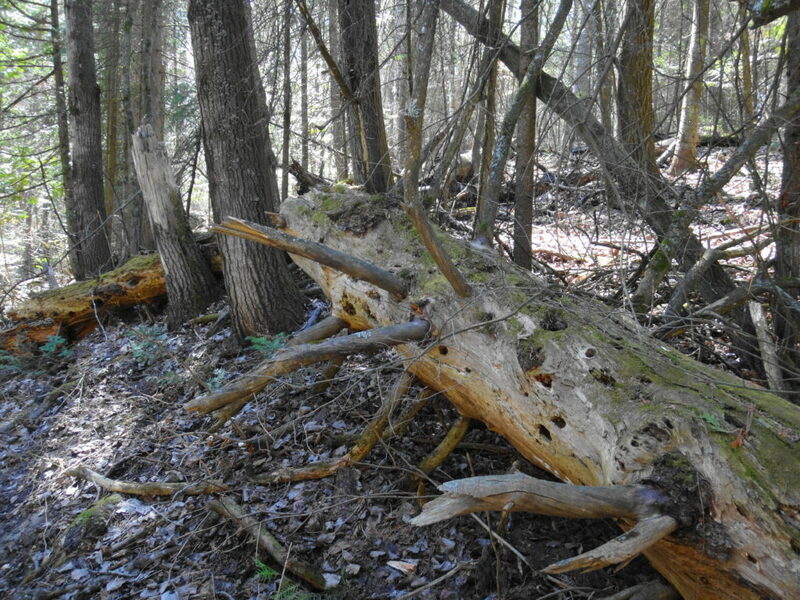 The Petawawa Research Forest, just outside nearby Chalk River, also provides wonderful opportunities for exploration. The Research Forest Museum, now inactive and partly abandoned, still remains open to the public — albeit quickly deteriorating. 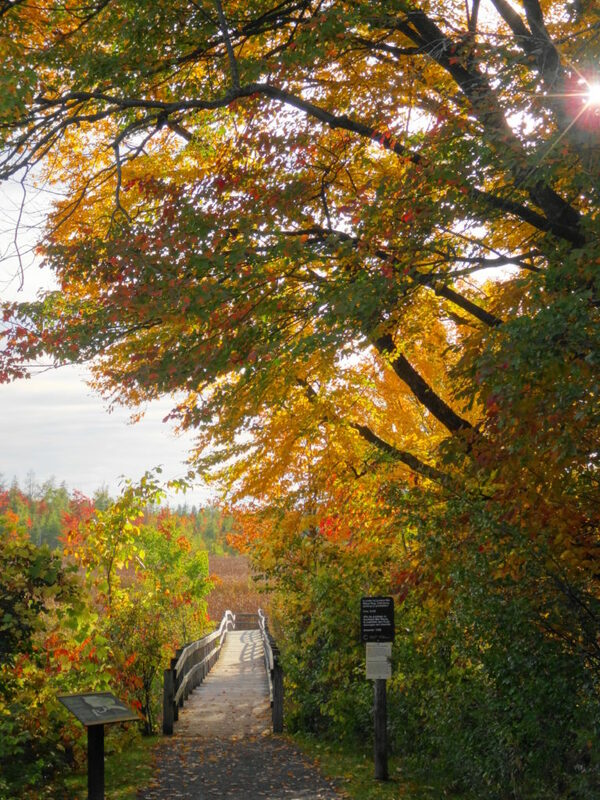 An interpretive trail still loops from the museum through the forest, and an old boardwalk still offers a short, but pretty walk along the shore of the Chalk River. A maze of access and logging roads leads deep into the forest, past a myriad of different tree communities, streams and wetlands. 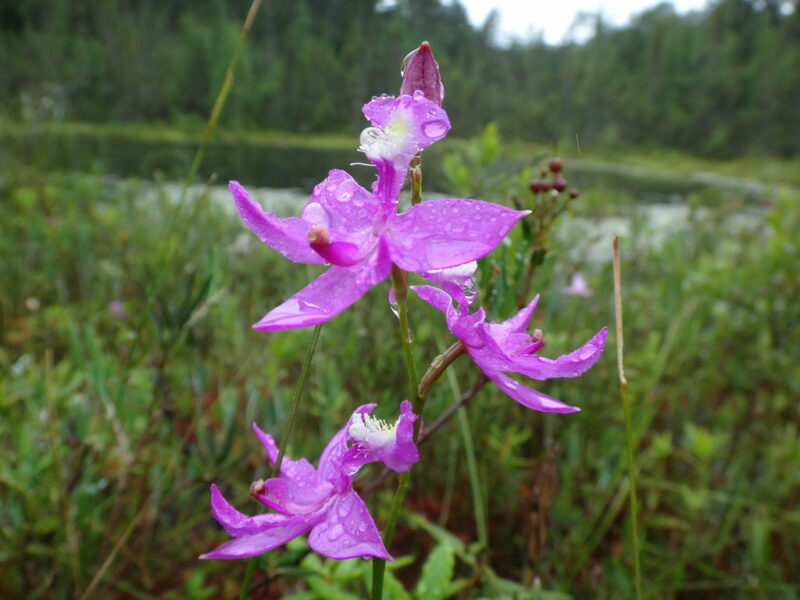 In particular, the research forest includes a large number of well-developed fens and bogs, some of which are very accessible and yet still virtually unknown and pristine. 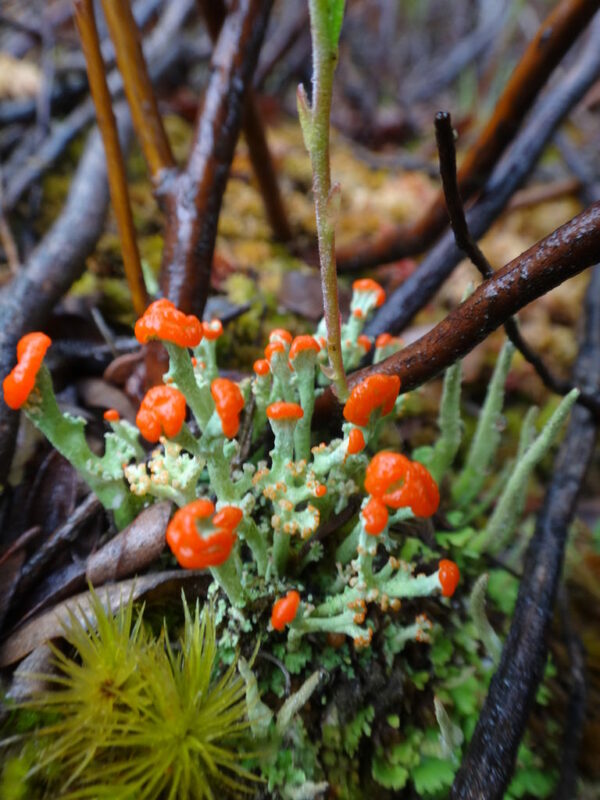 They provide a unique opportunity for a careful, conscientious visitor to explore the flora and fauna of these marvelous ecosystems. 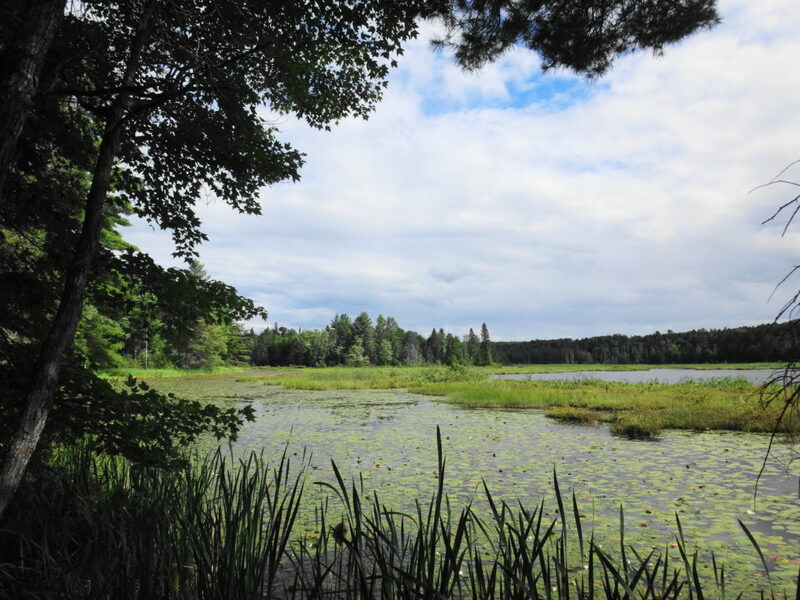 Unfortunately, summer visitors can expect to be trailed by a cloud of deer flies, which swarm from the sandy roads and trails in numbers that are hard to comprehend. 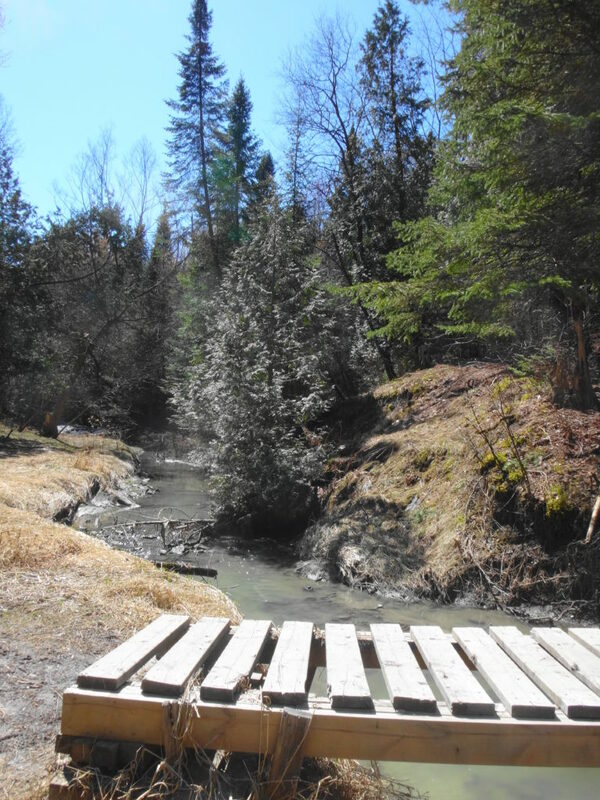 Once off the roads and into the forests and wetlands, however, the deer flies give way to the usual mosquitoes and blackflies, which respond much more readily to repellent. Of course, sensitive individuals can always choose to wear bug hats or bug shirts. Either way, the research forest is worth a visit. 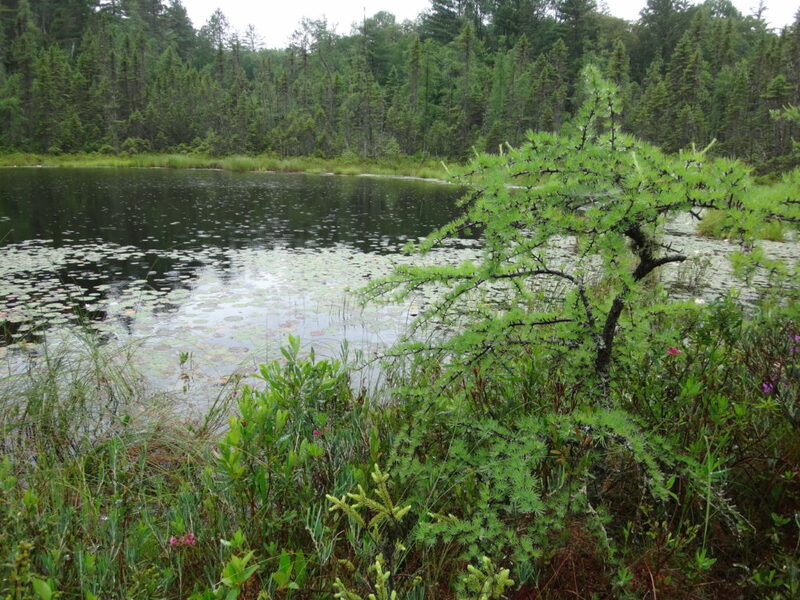 South of the Canadian Shield, Ontario has very few true bogs. 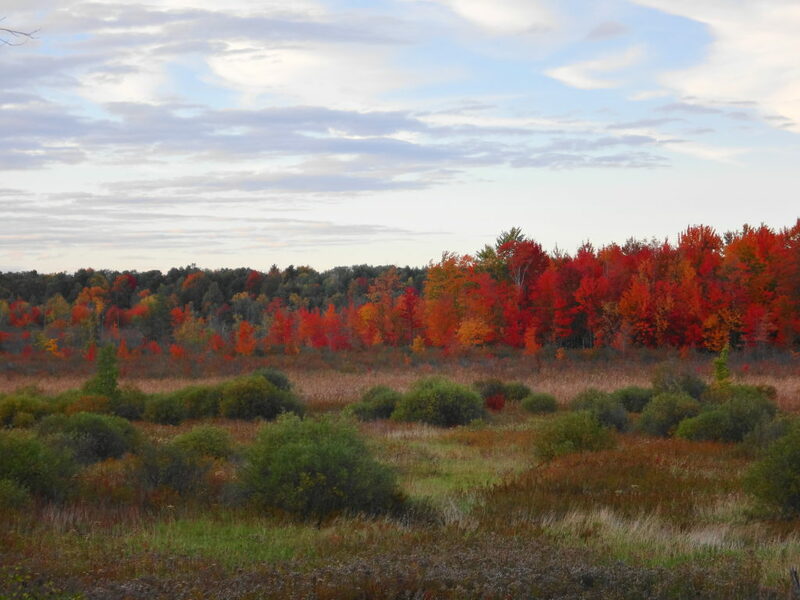 The two largest occur in Eastern Ontario, anchoring both ends of a 60 km long, regionally-significant, natural landscape corridor known as the Bog-to-Bog Link. At the east end of this link lies the Alfred Bog — Southern Ontario’s largest. 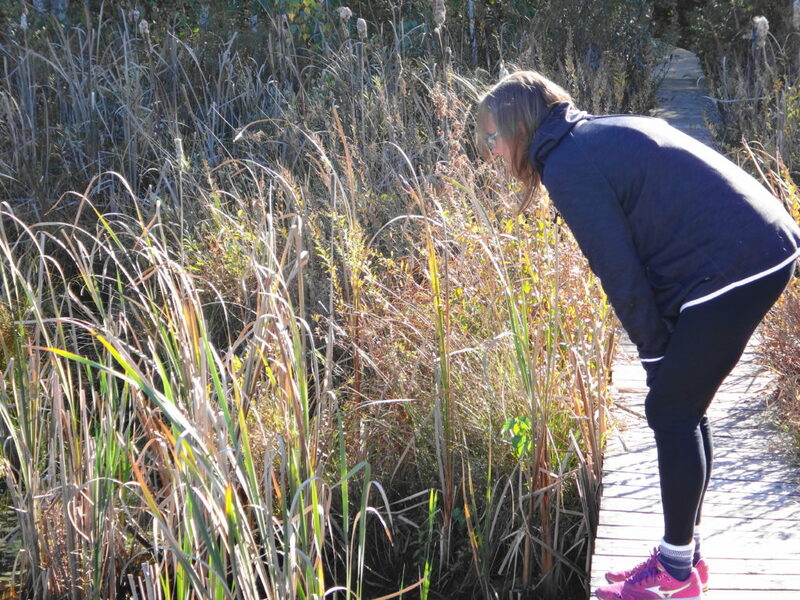 At the west end of the link lies Mer Bleue — Southern Ontario’s second largest and, arguably, most accessible and famous. Mer Bleue occupies an old, post-glacial flow channel of the Ottawa River. Two forested ridges — immense, old river sandbars — thrust into the heart of the flat, peaty wetland. Cold, nutrient-poor groundwater seeping through the sandy ridges, along with the poor drainage of the old clay channel, creates the perfect conditions for the formation of peat, which lies almost 10 metres deep in places. Toward the centre of the wetland, the peat has built up into an almost imperceptible, low dome. 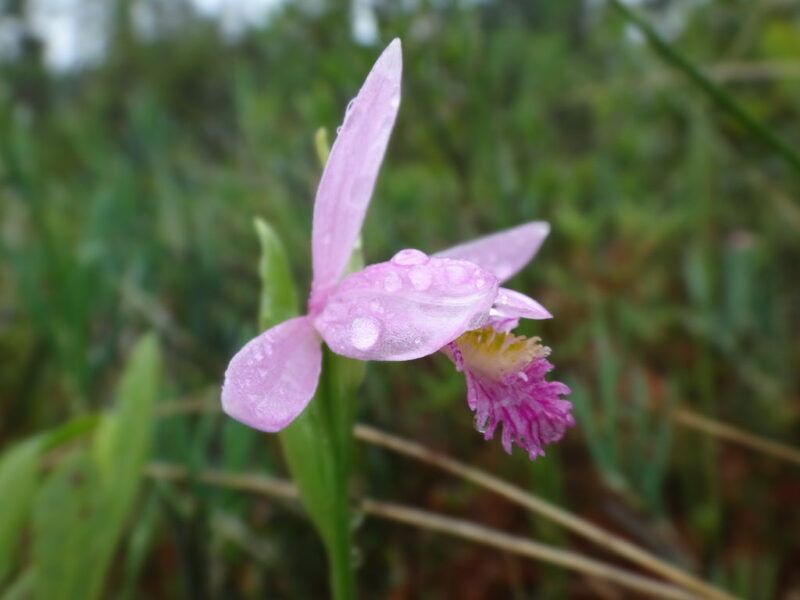 Out of contact with the underlying water, most of few, hardy plant species growing in the centre of the raised peat must survive entirely on trace nutrients deposited by rain, snow and dust. 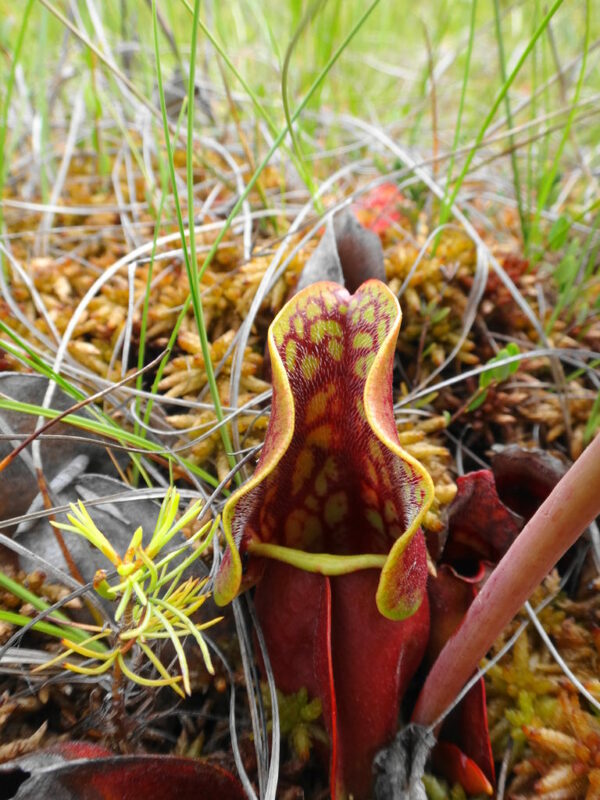 One or two carnivorous species, like the pitcher plant, supplement that diet with captured insects. 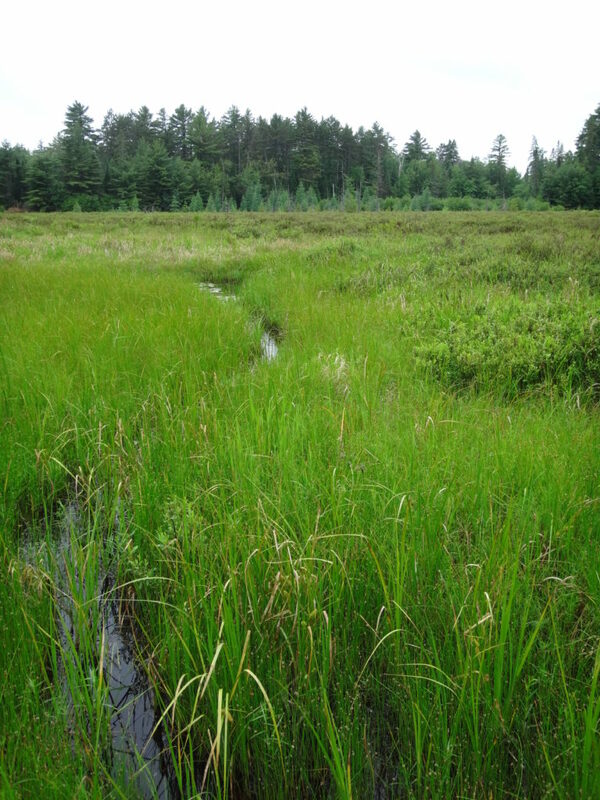 This reliance on aerial deposition of nutrients is what makes Mer Bleue a true bog. Mer Bleue welcomes visitors in any season. 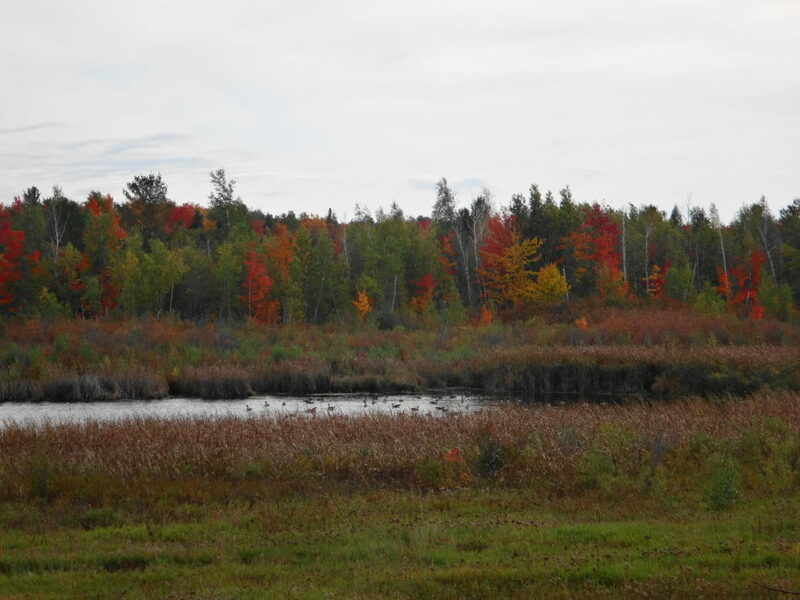 In the spring, the ridges attract migrating songbirds, while the watery moat along the edge of the peat mat (technically known as a “lagg”) attracts migrating waterfowl. Hawks hunt high over the ridges or low over the wetland. A dozen or so sandhill cranes stop in the area annually on their way north, with a few perhaps nesting somewhere deep within the bog. 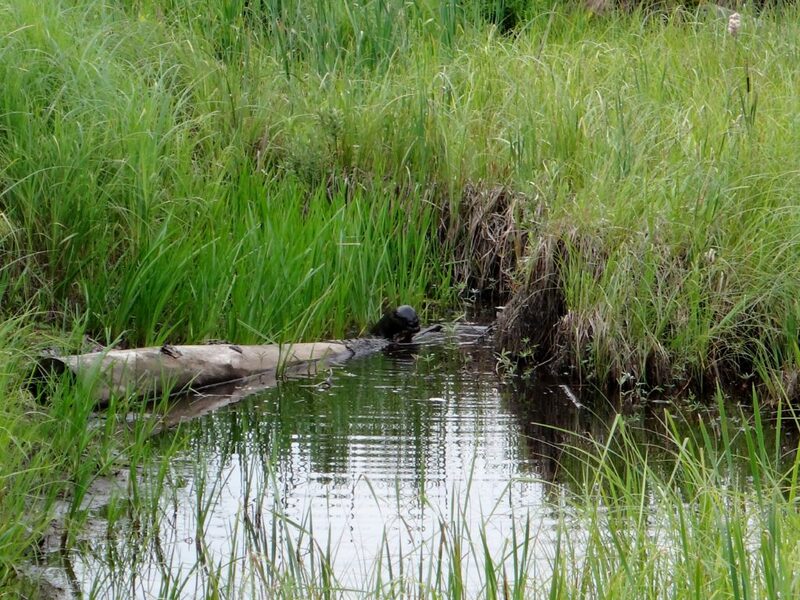 Beavers and muskrats ply the waters in the morning and evening to a chorus of frogs. 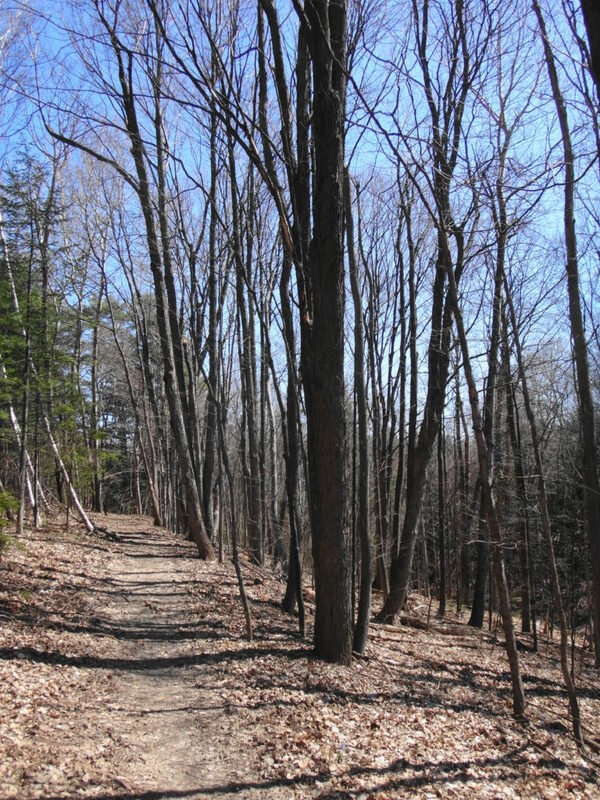 Through the summer, the shady, ridge trails provide a cool, relaxing hike. 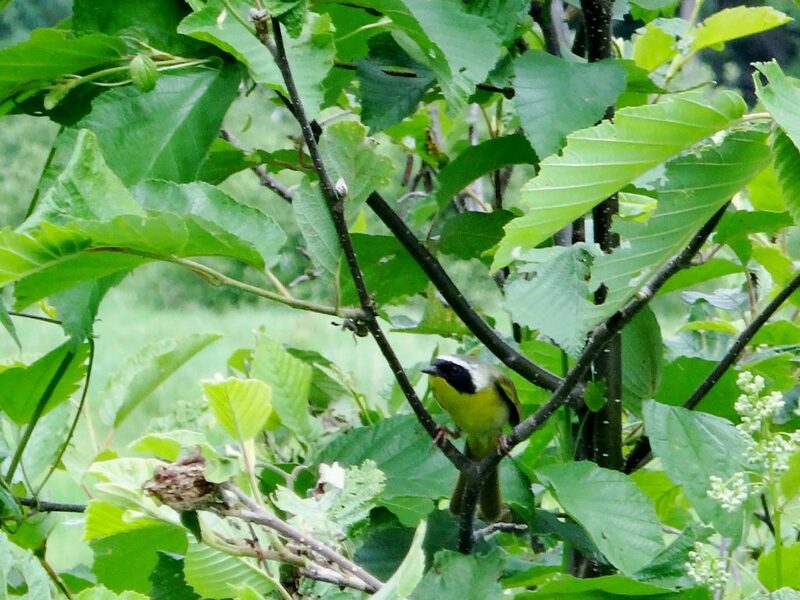 Vireos and pewees sing overhead. 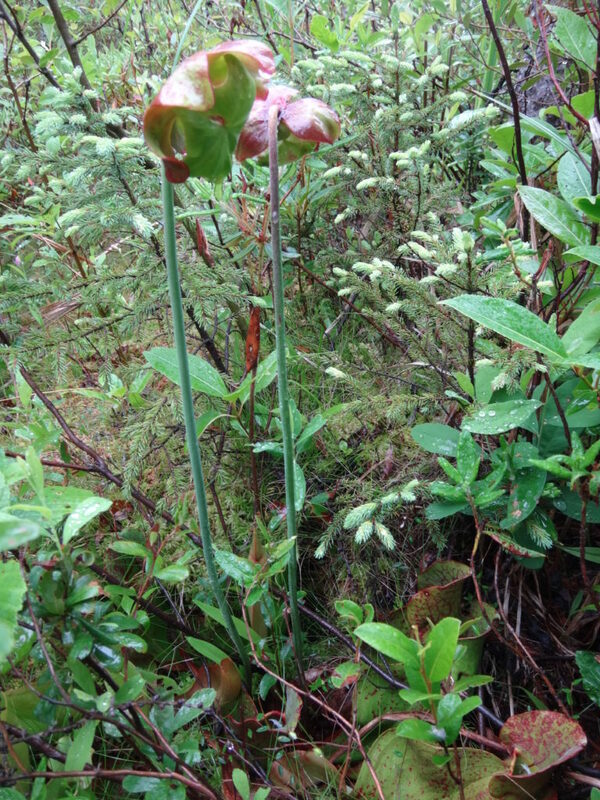 Ferns push up through the underbrush. Where a trail skirts the edge of a field, grey catbirds mew in a hedgerow, while a brown thrasher scolds from the treetops. Along the boardwalk, the heat of afternoon fills the air with the perfume of Labrador tea, bog rosemary, bog laurel, and leatherleaf. The scent of a few tamarack needles rubbed between the palms calls forth old memories. 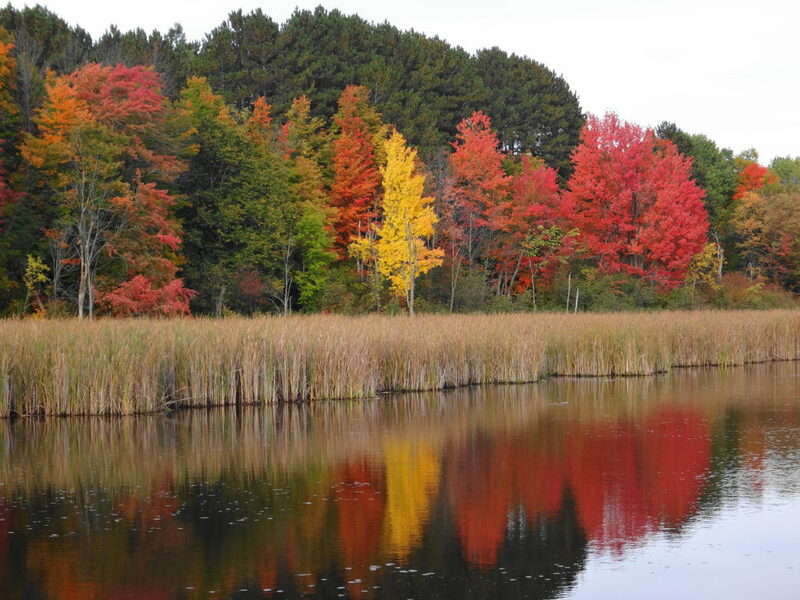 In autumn, the contrast of vegetation communities makes Mer Bleue one of the best places at which to enjoy the fall colours. 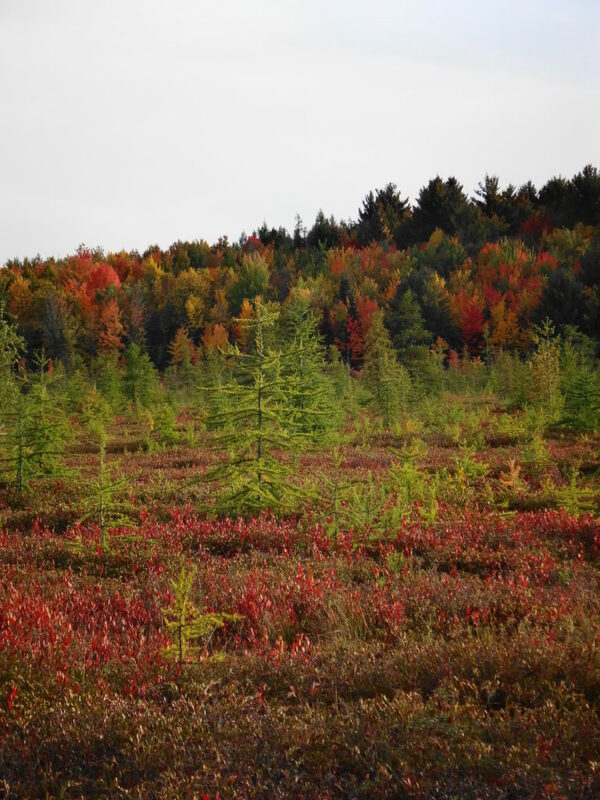 The bog turns a deep red, accented by the paling tamarack. 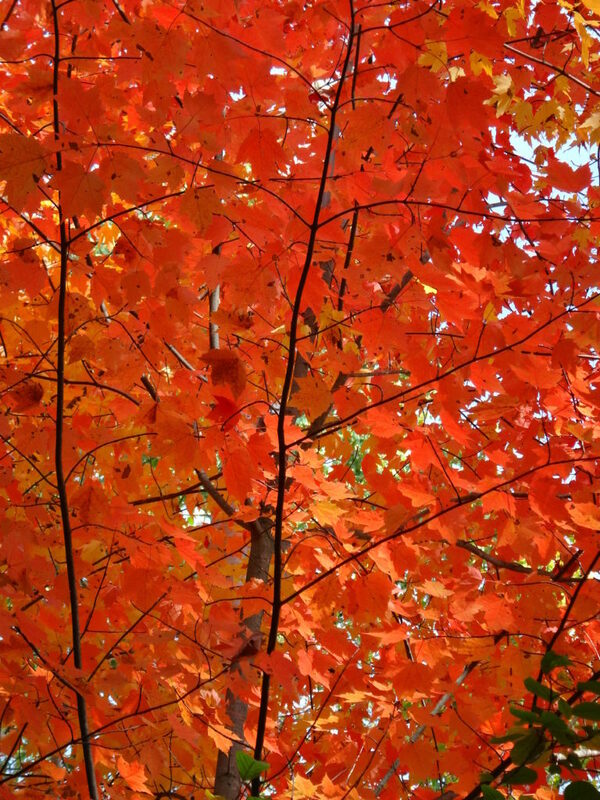 Red and gold maples line the edge of the ridges, brilliant against backgrounds of pine and spruce. 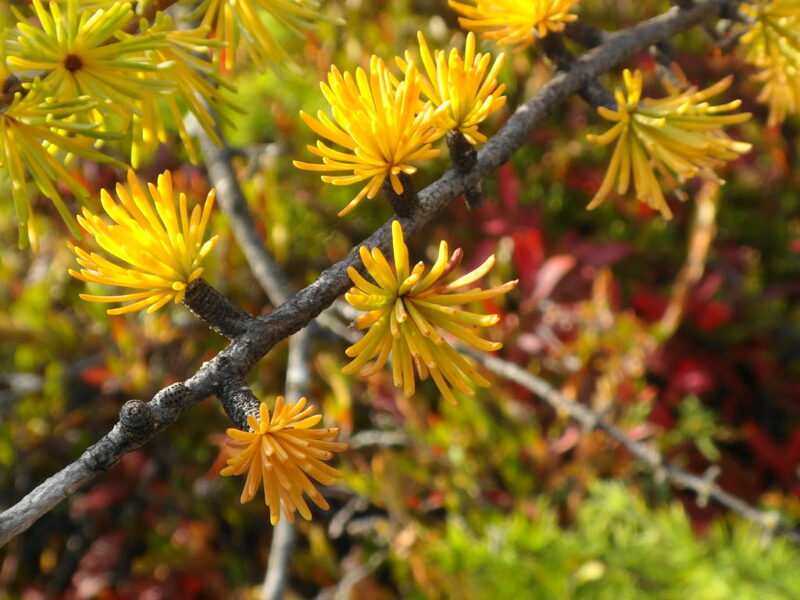 Variegated thickets of young birch stems support an awning of yellow leaves. The forest floor rustles with life, as squirrels, thrushes, sparrows and other creatures prepare for the long winter. Flocks of blackbirds and starlings pass noisily overhead, while strings of geese call plaintively in the distance. 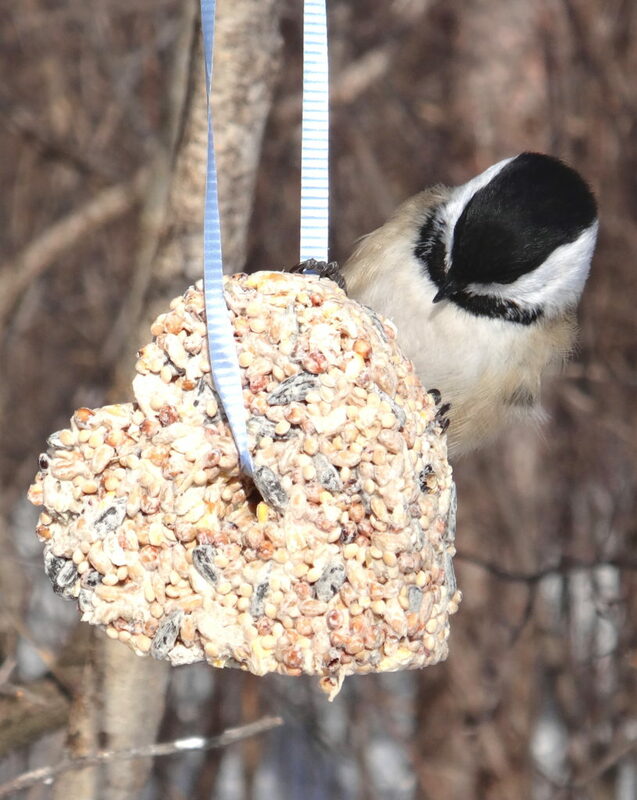 In winter, well-stocked bird feeders guarantee that the bright chatter of chickadees, nuthatches, woodpeckers and finches will greet visitors at every trailhead. 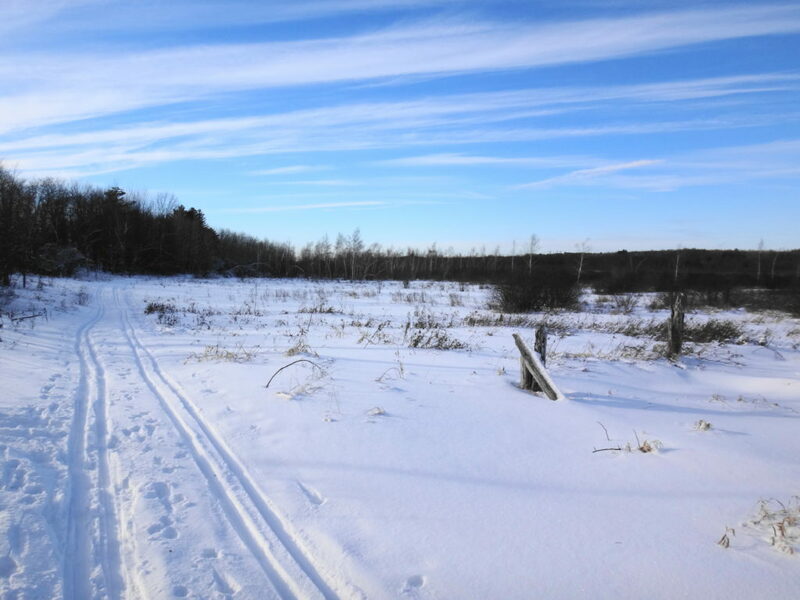 Animal tracks criss-cross the trails: squirrels, snowshoe hares, mice and voles, coyotes, weasels, deer, and even moose. Those hoping to lay down their own tracks in fresh snow will need to rise early. 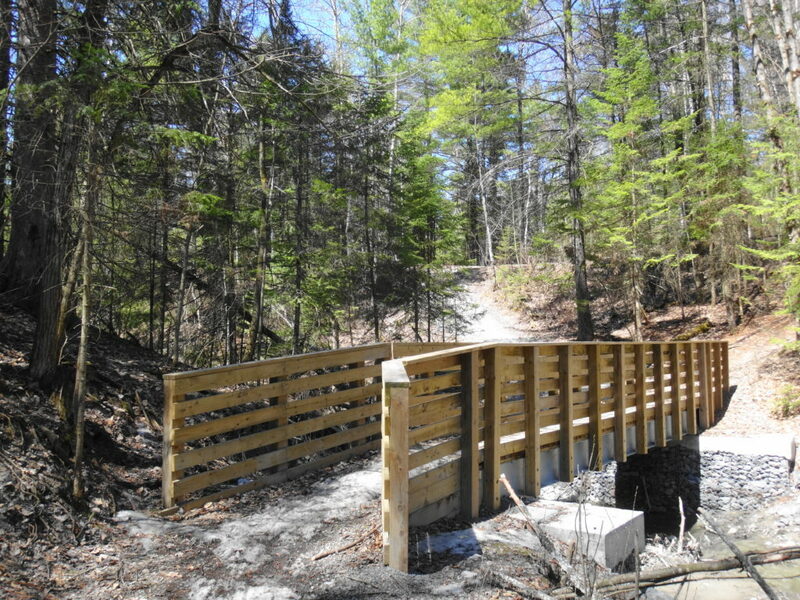 Later in the day, when the parking lots begin to fill with visitors, the compacted trails provide an easy walk in the woods or out onto the boardwalk. The NCC does not provide heated shelters or warm-up huts at Mer Bleue, so winter visitors should dress appropriately. The boardwalk, in particular, lies exposed to the wind, which blows unhindered across the bog. At those times, frostbite becomes a real risk. On calm days, however, particularly those brilliant blue days of January and February, when a frigid Arctic high sits over the City and the snow squeaks underfoot, the moisture rising from the peat will sometimes crystallize in a delicate, morning hoarfrost on the bog, sparkling in the sunlight. On those mornings, one hardly feels the cold. Mer Bleue lies only fifteen minutes from Parliament Hill and just five minutes off Highway 417 — the Trans-Canada Highway (http://www.ncc-ccn.gc.ca/places-to-visit/greenbelt/mer-bleue). Every trailhead has a small parking area, where visitors will find basic outhouses. There is no charge for parking or use of the area. Visitors should remember that the international community has recognized Mer Bleue as a globally significant wetland under the Ramsar Convention (www.ramsar.org). Please stay on the trails and the boardwalk. 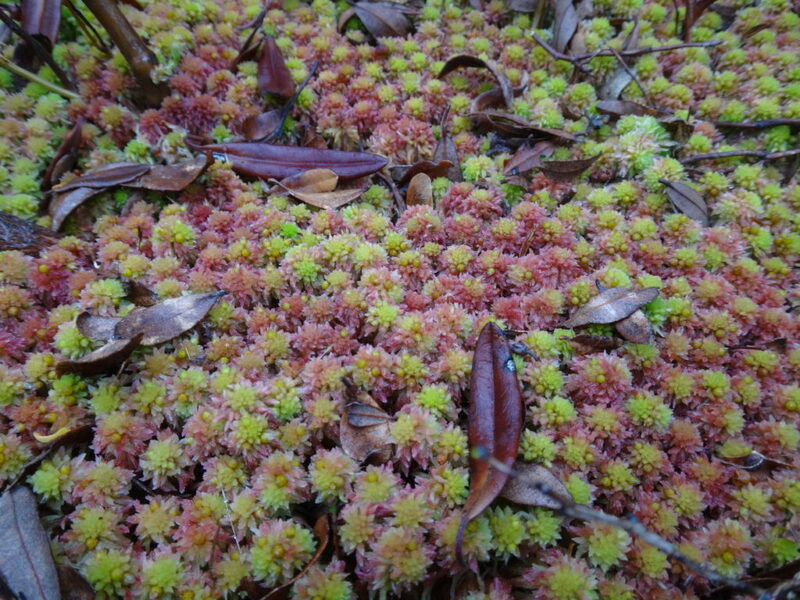 The bog may look inviting, but it is both delicate and hazardous. A stray footstep can destroy decades of painstakingly slow plant growth or lead to a fatal plunge through the mat into the tannic waters below. Such a plunge would lead to an immortality of sorts, as the tannins of the bog preserved and slowly transformed the unwary soul into a leathery mummy. However, such immortality would be unappreciated both by the victim, the victim’s family, and posterity. Take a photograph instead. The forest holds no more magical sound than the song of the hermit thrush at dusk. In the calm of evening, when the breeze drops and the leaves hang still, it flutes through the trees: a short, liquid, melancholy song. You stand transfixed in the twilight of the trail, grasping for a lost memory or emotion. Perhaps some ancestral memory of the primaevel forest. Time pauses. 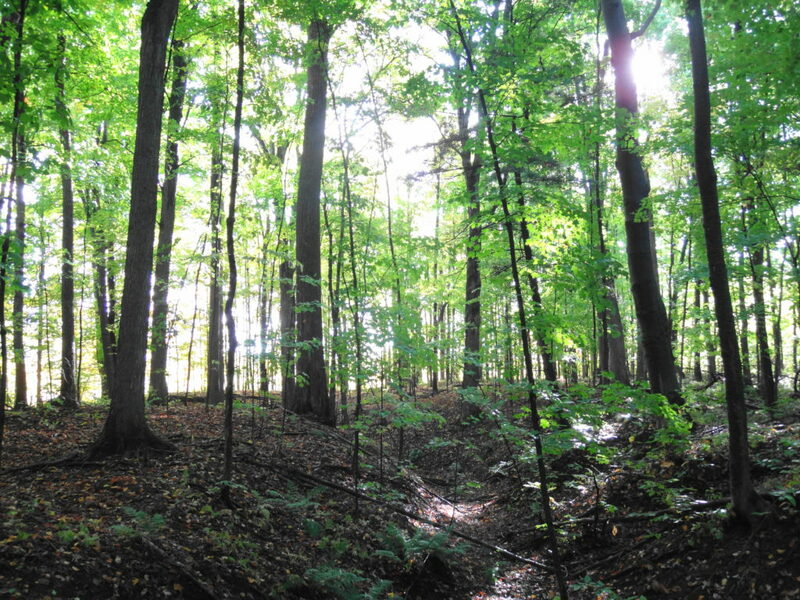 For anyone living in Orleans, in Ottawa’s east end, a short walk down the pathway into Bilberry Creek Ravine leaves behind the sounds of the City and carries one into the world of the wood thrush. 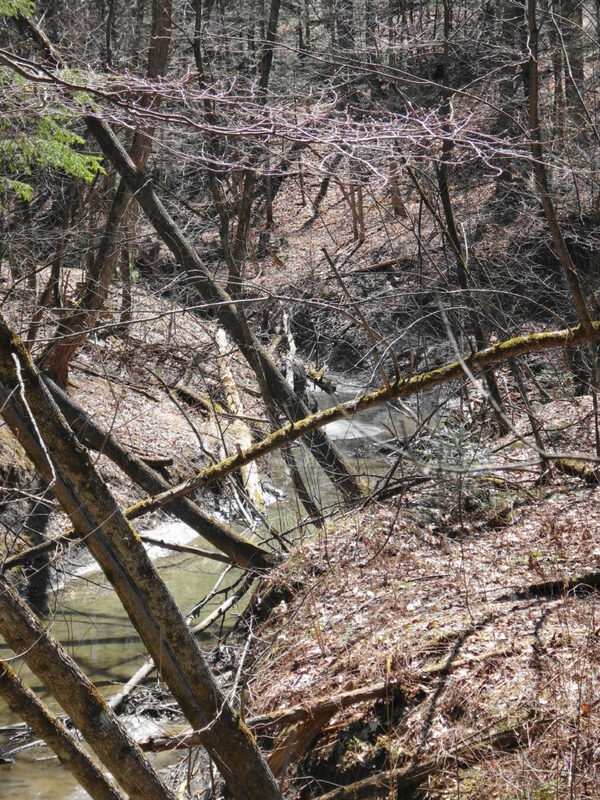 The steep, wooded slopes of the ravine create a quiet haven. The chuckling of the creek rises from somewhere below. The thick duff of the forest floor rustles with hidden growth and life. On an early, warm Spring morning, I stood quiet and still beside the trail in Bilberry Creek Ravine, hoping for a hermit thrush to come within photography range. I had stopped at the fuss of chickadees and nuthatches in the pines ahead, thinking that an owl or hawk might be hidden in the dense boughs. The hermit thrush foraged nearby on the forest floor, teasing. It moved from shadow to shadow, clearly visible in my binoculars, but just beyond the reach of my pocket camera’s small lens. As I waited patiently for the thrush to come closer, I caught another movement in the corner of my eye. 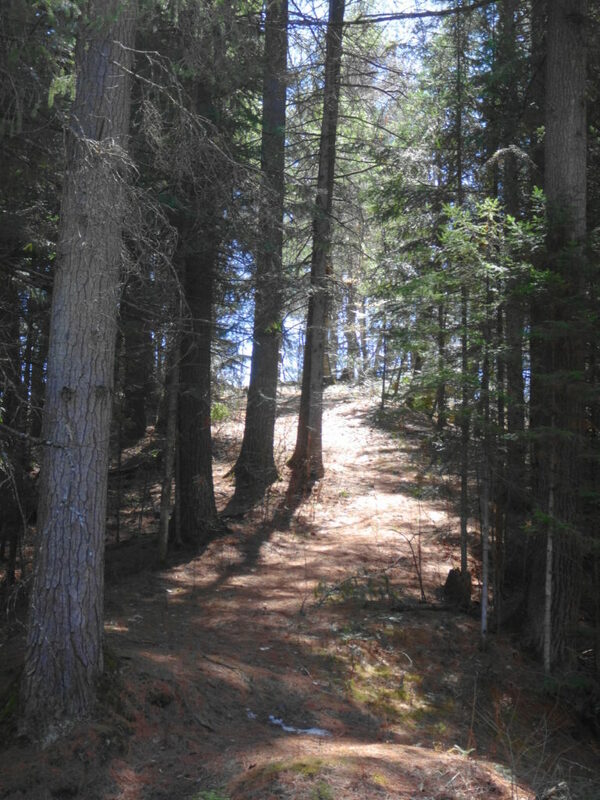 30 metres farther up the slope, almost screened by underbrush, a red fox climbed on to a rotting log, into a fleck of sunlight piercing the pine canopy. Very slowly, I turned my head to watch it. It sat upright in the rare patch of warmth, the light glowing in its fur. As carefully as possible, I inched my binoculars back up to my eyes. But not carefully enough. The fox turned its head toward me, lowering itself warily to the log. I froze. For long seconds, we both stood still, our gazes locked on each other. Then I moved slightly, just a shift of balance. With a quick turn, the fox rose and vanished into the brush. Thinking that the fox had prompted the chattering of the songbirds, I started again along the trail and jumped a small tributary brook. Just at that moment, in the pine trees behind me, a barred owl began to call: “who, who, who-calls-for-you”. Once surrounded by development, most urban forests lose their wildest elements within a few months or years. The noise and visual disturbance drive away the most sensitive animals. Cats prowl along the wooded edges, hunting songbirds and small mammals with ruthless efficiency. 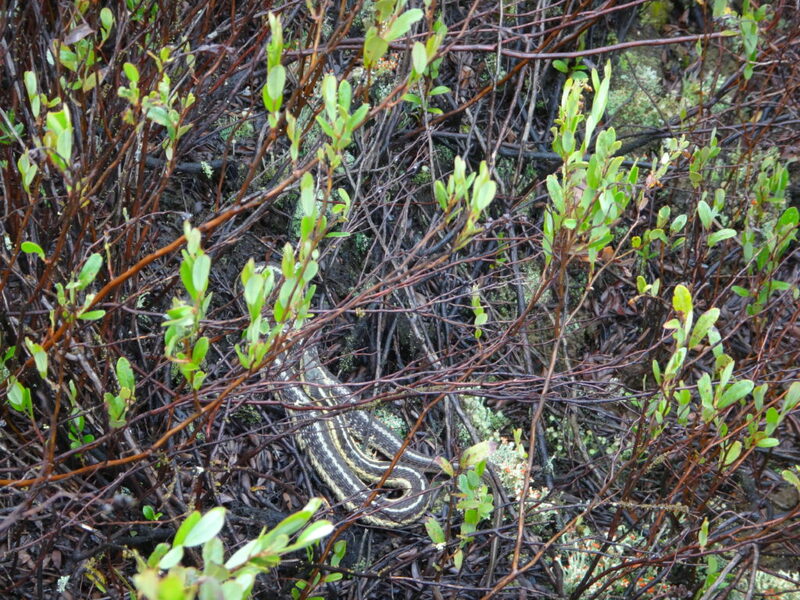 Neighbours dump lawn and garden waste into the forest, introducing exotic and invasive plants. Returning fishermen dispose of unused, invasive nightcrawlers (earthworms), changing the soil and nutrient cycles. Temperatures in the forest rise, light increases, and humidity drops. The slow-growing trees that once prospered in the cool, damp woodland give way to faster-growing, sun and heat-loving species. Such woodlands still have value to a community and a city. Both the forest and the community find a new balance. The chickadees that brighten the winter woodland will still delight children, as will the play of the squirrels in the summer. The leaves will still rustle in the wind. 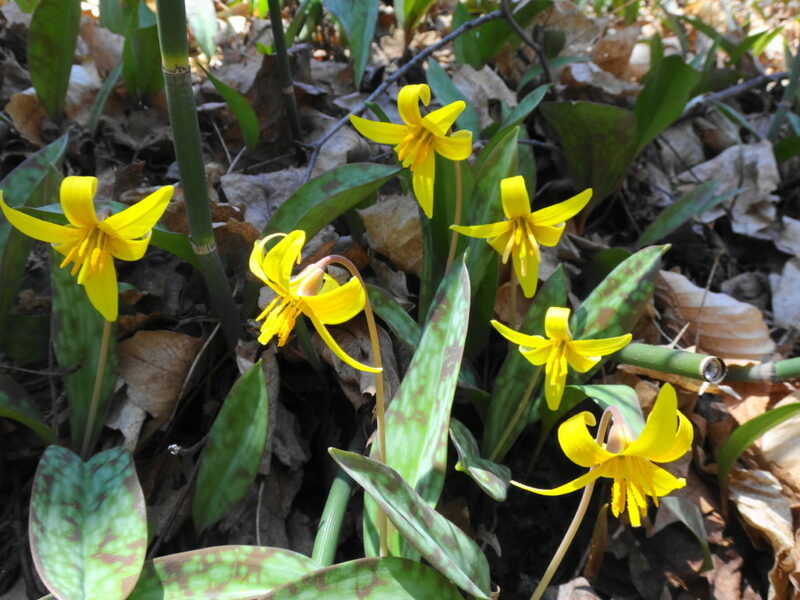 And if trilliums give way to bluets, will anyone but the most ardent naturalist notice or really mind? But those urban forests with the capacity to resist such change deserve special reverance and protection. 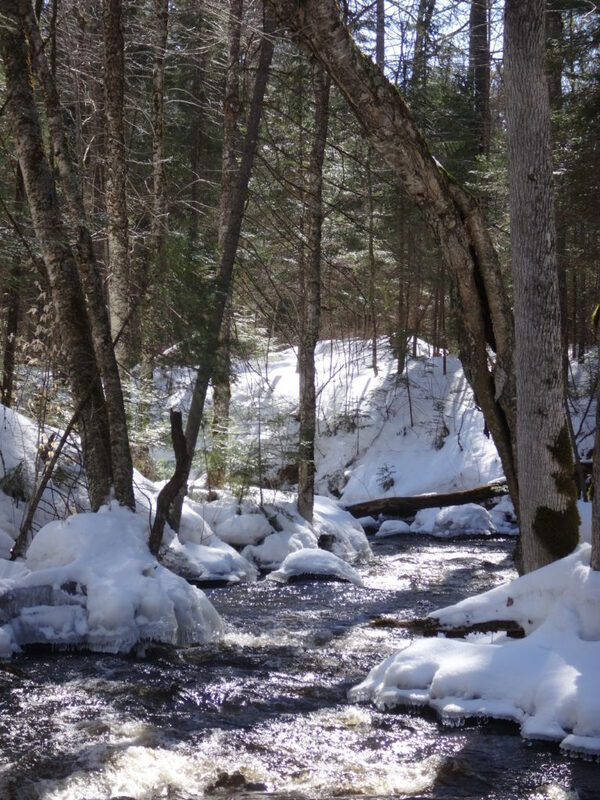 Nestled in its ravine, Bilberry Creek is such a place. The ravine retains humidity and cooler air, shields the forest from traffic noise and prying eyes, retains its secrets. 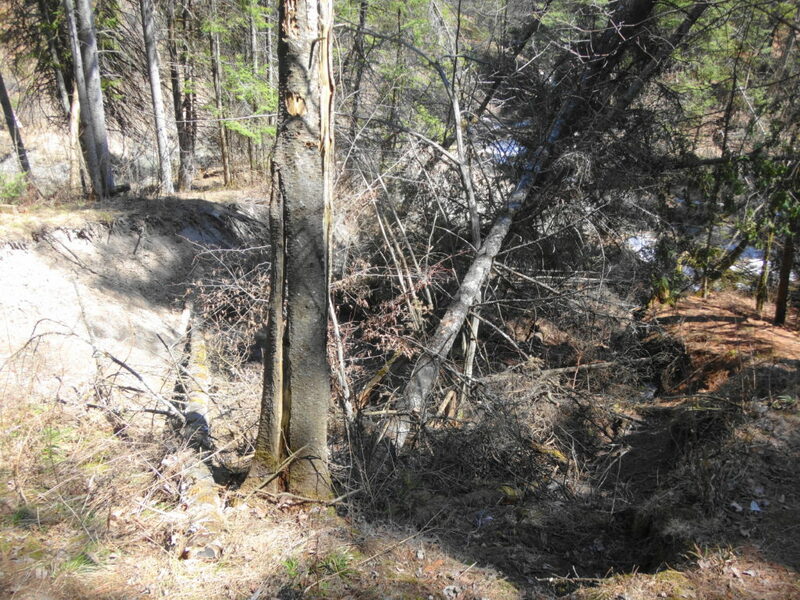 Although a graded, multi-use pathway cuts through the forest at one point, the steep clay slopes limit much of the ravine to rough, narrow nature trails. 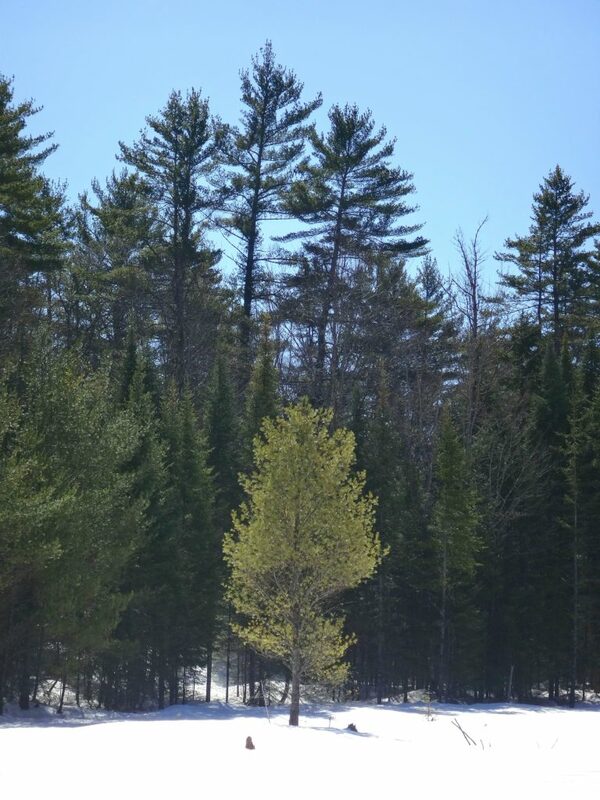 Mature, “super-canopy” white pines and hemlocks thrust through the deciduous trees, harkening back to the ancient, pre-settlement, northern hardwood forest that once blanketed most of central Canada. Tall, pockmarked snags provide nesting cavities for animals and birds. Massive nurse logs lie decaying in undergrowth, returning their nutrients to the soil, holding moisture for insects and fungi, and sheltering amphibians, mice and voles. The air is redolent with the rich odour of life. Bilberry Creek, itself, appears surprisingly healthy for an urban watercourse. 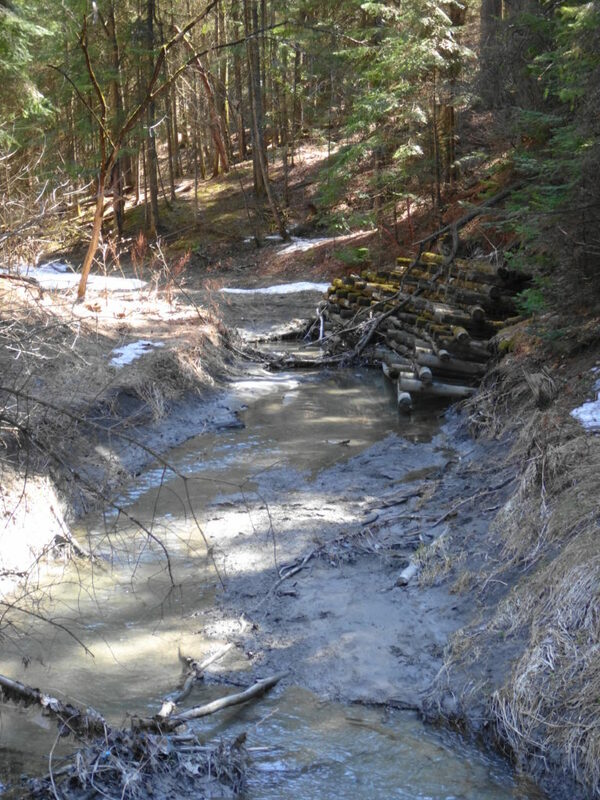 On a spring morning, erosion and slope failures appear all along the creek, turning it grey with silt and clay Woody debris litters and clogs the channel. But did development cause these things, or do they result from the natural process of a young creek cutting into deep, clay soils? Probably both. Certainly the presence of old log crib walls along the creek suggests that the processes aren’t entirely new. 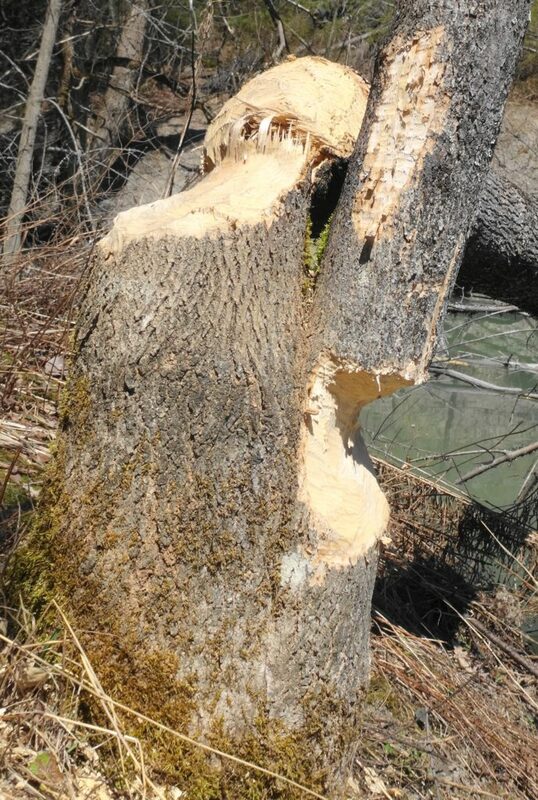 In any event, they don’t appear to have discouraged the local beaver. 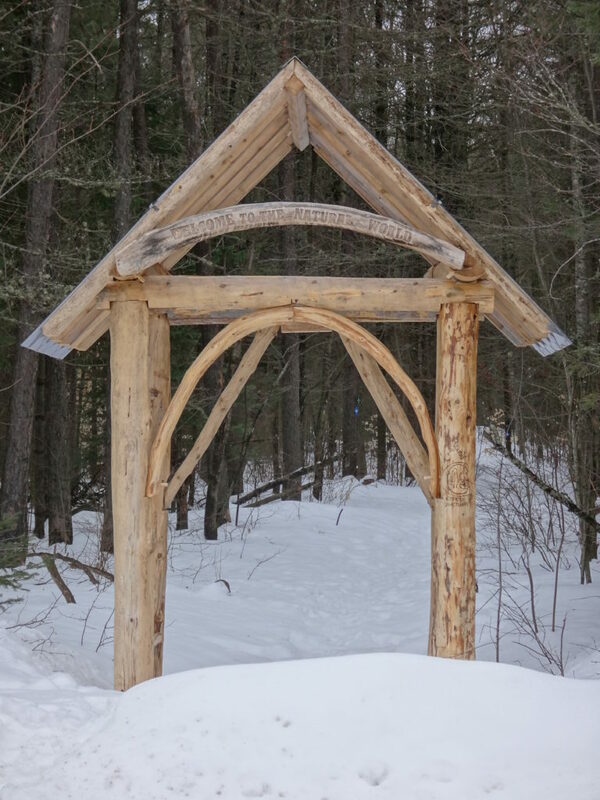 I would like to visit Bilberry Creek Ravine again in the winter. I can imagine strapping on a pair of snowshoes and walking softly down the trail into the hush and swish of snow sifting through the pines. 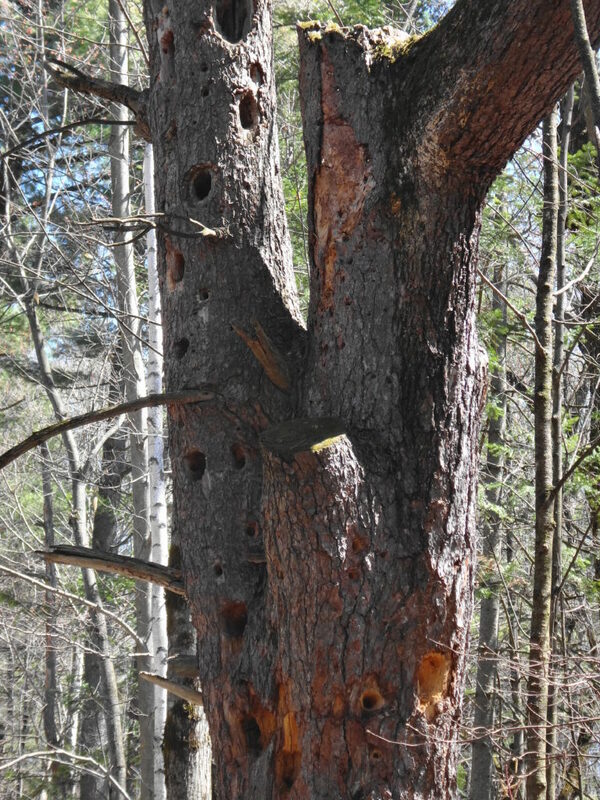 Up ahead, perhaps, a pileated woodpecker would hammer on an old hemlock. Perhaps the trail of a fox or fisher would cross the track. After a while, I’d find a comfortable place to pause. I’d pull a flask of coffee from my small pack, and a sandwich, and I’d stand there lost in the woods until the cold finally drove me onward or back.